Happy Friday! Have you ever had one of those weeks where you just have zero drive to do any work? I’m normally totally on top of everything, but ever since I got back from San Francisco on Sunday I’ve had trouble getting back into the swing of things. I think I just needed a few days to recharge from those back-to-back trips. It’s like I need a vacation from my vacation… does that make sense? Several of my friends are going out of town for the weekend for various things, so I’m going to take this opportunity to sleep, get organized, do laundry, and just hang out. I’m also hoping to sit down and do some planning for the upcoming months in terms of content for the blog and my YouTube channel – I’ve got some ideas that I can’t wait to share with you, but if there are ever any videos or tutorials you are dying to see, please let me know! While my Miami trip is behind me, I’m still on the lookout for the cutest coverups – I head to Hawaii in May and want to be fully stocked! Below are some of the best of the best. Whether you’re shopping for spring break or for 4th of July weekend, this mixed print dress is a touch patriotic and totally adorable. This shorter LemLem caftan is such a stellar piece to just throw on and go. No hassles to deal with like a drawstring or off-the-shoulder complications! This breezy striped dress could easily go from the beach to dinner with just a change of accessories. Embroidery is always at the top of my list when it comes to beachwear, and this dress is no different. Another versatile piece that could go from day to night! Looking for a little more coverage? This Pitusa maxi dress is so gorgeously Grecian and under $100! Every single image from your Miami trip is so perfect for Pinterest– I love it!! 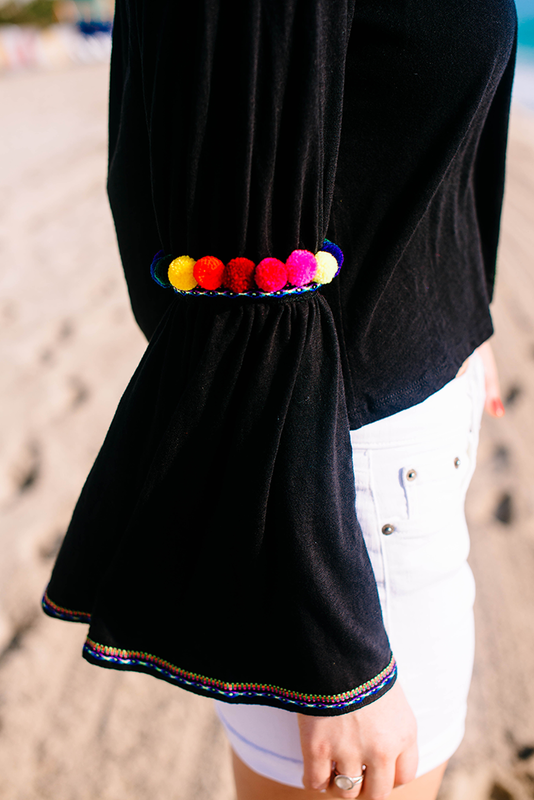 I love a good bell sleeve top and this one is so fun! I’m daydreaming of some upcoming beach trips so I’ll be checking out your cover-up suggestions and Hawaii posts later in May. You look fabulous, Merritt! Love these photos. What a fun top. So cute, I love all the colorful detailing on the top. Looks like it was an amazing trip!